The weekend has been cold and rainy. Mother Nature is such a tease. These are both so beautiful! It is getting down right hot where I am. I'm getting a little scared of what August is going to feel like. Our weather here has been crazy. I have used a photo of yours for my haiku writing, credit to you. Beautiful images, Reena! Although I really love forsythia, the second shot w/o it is fabulous! Masterful editing! Ah, a tease she is indeed! We have little glimpses of sunshine and then the clouds/wind/rain and chilly temps return! Hi Reena...What is up with this weather..anyway???? Love forsythia'...the second shot I like! She's doing the same around these parts. Beautiful foggy day, there. Yes Mother Nature is a tease, and she can be brutal at times. Most of my daffodils froze a couple of days ago. I agree Mother Nature is a tease. I love your images, Reena!! I hope you have a wonderful week ahead. I love the misty quality of those trees! UGH! When the weather spun back to more springlike yuck, I curled up into a little ball and keened all week long. I think there was some gnashing of teeth in there too. Hard frost last night just made it all so sordid. These are just gorgeous Reena. I love the wonderful tones on both of them. Sending you wishes for a fantastic Monday. You've caught her beauty well. We can never escape from being teased. Spooky, evocative, old-worldly, and beautiful. Mother Nature is indeed a tease! Predictions of snow at the end of the week. Crazy! Beautiful. I especially love the patina (if that is what it's called) of the second one. She is, and plays by her own rules! Love the yellow! and a tad confused this year!! 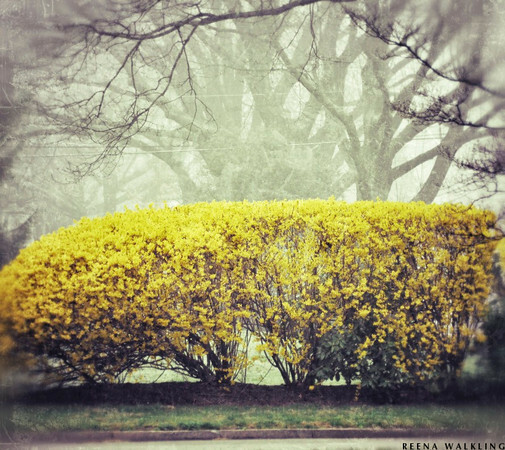 beautiful captures, i love the forsythia!! Wow - who can be angry at the weather when you get such gorgeous photos? Yep, I have to agree Mother Nature is just messing with us!! Your photos look beautiful..
You bring out the beauty of spring - blooms and birds. Our rain here in Northern California has stopped. It's cool and sunny today. Mother nature has been fickle here too! Gorgeous photos! I would love the feeling of cold rain. It's so hot here in Bangalore! We could do with a bit of slowing down here -- 90s yesterday and today. Too much too fast. Ya bet your sweet bloomers she has. I do believe Mother Nature has done went and gone all bi~polar on us this year. What beautiful images ya captured lurkin' in the foggy mist sweetie! Summer, Fall, Winter and Pollen. March was like April and April is like May. 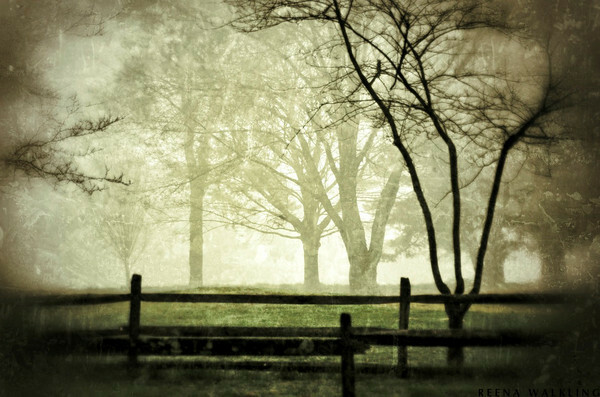 Misty fog, trees and fence. Beautiful. fog is so beautiful, but just in your photos, don't like it when it is here for sure. The forsythia is lovely even in the rain. How strange to see the Forsythias trimmed at the top to form a hedge! Here in Italy we only use them as isolated specimen. Have a nice day Reena! Yes she is but that is the beauty of Mother Nature!! I linked this post on my blog to the Garden Club I am doing. If you want me to take it off... let me know. They are both great! The second one is dark, moody, and a little bit eerie! Love it!